For most of the session, the major indexes were aimlessly meandering below their respective unchanged lines waiting for the release of the Fed minutes in anticipation of possible changes to interest rate policy. In a sense, that wait was rewarded as markets interpreted the FOMC minutes as “dovish” meaning that rate hikes may not arrive in such an aggressive manner as anticipated. Although the Fed pretty much confirmed a June hike, the 2% inflation target, which was hit back in March, was adjusted. It was noted that if inflation moves slightly above that target, it might do so only temporarily. Market reaction was instant with bond yields tumbling as the 10-year slipped back to its 3% level scoring its biggest drop in just about 2 months and settling at one-week lows. Bond prices, which move opposite to yields, were the beneficiary with the 20-year bond (TLT) gaining +0.73%. The major indexes scrambled back above their respective unchanged lines and scored modest gains with the Nasdaq leading the pack with +0.64%, while the US Dollar (UUP) reduced early gains but still ended up +0.41%. 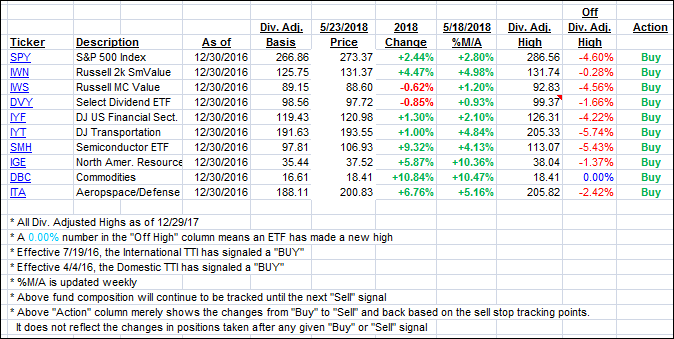 The below table simply demonstrates the magnitude with which some of the ETFs are fluctuating in regards to their positions above or below their respective individual trend lines (%M/A). A break below, represented by a negative number, shows weakness, while a break above, represented by a positive percentage, shows strength. Again, the %M/A column above shows the position of the various ETFs in relation to their respective long term trend lines, while the trailing sell stops are being tracked in the “Off High” column. The “Action” column will signal a “Sell” once the -7.5% point has been taken out in the “Off High” column. Our Trend Tracking Indexes (TTIs) were mixed again as the international markets showed weakness. This entry was posted in Market Commentary and tagged DJIA, ETFs, QQQ, SPX, TLT, Trend Tracking Indexes, UUP. Bookmark the permalink.